Cursed! Not just in the sense that he was mocked and his detractors cursed at him, but in the sense that he received the curse of death because of our sin. He did what was hideous and scandalous; he died on a Cross — hung to a tree in front of a jeering mob, executed like sub-human scum. But the beauty of his shame and disgrace is that God made it our redemption. 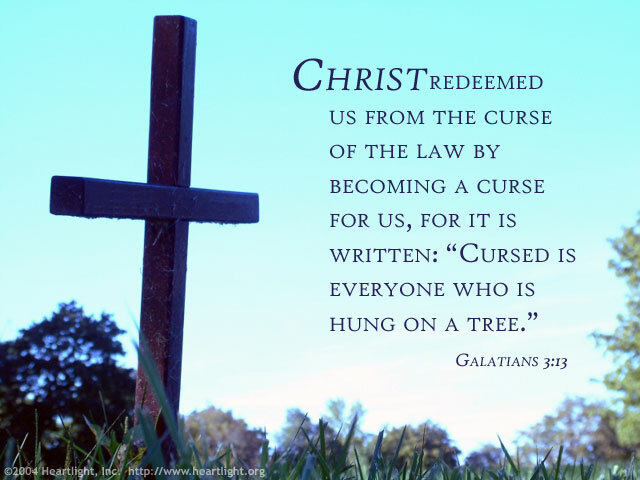 Jesus' ridicule and curse bought us freedom from the curse of our own sins. Praise God! Praise Jesus! Almighty Father, I can't even pretend to fathom your ways and why you would require of yourself such a horrific sacrifice to redeem me. Precious Savior, I can't imagine what it was like to hang before a mob carrying the sin of the whole world. All I can do is ask the Holy Spirit to make my thoughts and words convey the gratitude of my heart as he intercedes for me now. Thank you! Praise you! May my life truly honor you! In the mighty name of Jesus, I praise. Amen.